This patient presented with several weeks of crampy abdominal pain and blood-tinged stools. The images above show intussusception of terminal ileum into the cecum. Intussusception (perennial spelling bee candidate, incidentally) occurs when the proximal bowel telescopes into the lumen of the more distal bowel, causing bowel congestion, obstruction, even ischemia. In adults, it's a red flag for cancer. In this case, it was a giant fungating goomba at the ileocecal valve acting as the lead point. Laparoscopic right colectomy = cure (stage II disease). 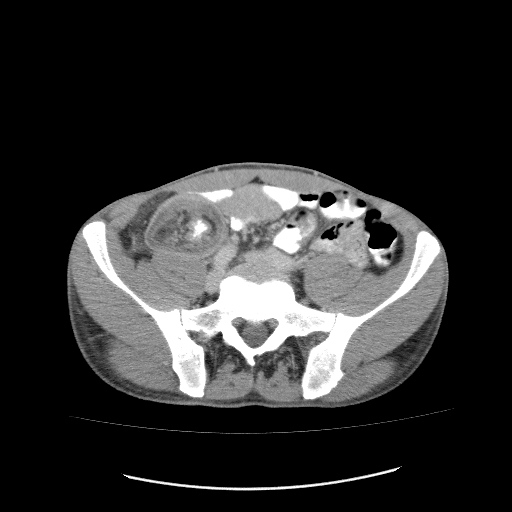 Classic case of a malignant lead point in intussusception. This was an older person, no? Not quite as satisfying as winning a BCS title, but what is? And thats why I didn't go into Surgery, besides my 5 thumbs, left handedness, and insistance on a specialty that requires regular coffee breaks/sitting all day/post call days off. I could never pronounce "Intussusception" without sounding like a combination of a drunk Barney Frank/Sylvester the Cat. Seriously, how do you say that word without spitting?? I guess you had to make an incision to get the thing out? one of my most memorable cases as a third year student was a female patient with the exact same presentation... and probably one of the reasons (among many) that i'm hoping to match surgery in a little less than 3 weeks. always a pleasure reading your blog! thanks! are you not posting until the Cavs win another game?? ?